When you first come to Herland, ask for directions to Josephine Mead’s piece which is enfolded in a shroud, sitting quietly in a back room. Step inside, let the light comfort you, let her voice soothe you, allow her words to inspire you. Stay long enough for “to utter aloud or render in speech” to wash away the ordinariness of the everyday, and, when you are ready, step outside refreshed and ready to absorb the ideas expressed by the other thirty-two women artists in this exhibition. As your eyes adjust, move diagonally to the right and walk between two rows of fiction protecting shadows and shapes of Patricia Carolan’s “Charm’s Curse (Pointing the bone)”. This piece tells a little-known story about Charmian Clift, one of Australia’s exemplary story tellers, and her unknown daughter. This is an interactive piece; flick through the book, watch the words change in the mirror, wonder about the sorrow of Charm’s Curse. Now make your way to the middle of the room and contemplate Ulvi Haagensen’s “Nothing is dirty!” balancing on stilts at the end of the lesbian fiction stack. Is this beautifully constructed brush a frivolous piece, or does the absence of dirt have a deeper meaning? Admire Haagensen’s handiwork in Herland while you think about this, then cast your eyes left and right so that you can take in the two quilts included in this exhibition. Eileen Hayley’s “Utopia: A Patchwork” and Deborah Eddy’s “Non-functional feminist quilt”, both too precious to fulfil the quilt’s usual purpose, demonstrate the versatility of women’s work and the expansiveness of women’s art. Step lightly in the space and take in the detail of these quilts. Whichever way you go in the Herland exhibition, your next port of call will be red — a colour infused with meaning in so many aspects of women’s identity. If you are drawn to the “Non-functional feminist quilt”, your path takes you towards “Black Barbie”, made in Australia by Maddison Gibbs. Black Barbie stands proudly, celebrating diversity, and reminding us that black lives matter. At the other end of the room, also dominated by the colour of blood, are Sara Ferrington’s “Mental Load (the silent scream)” and Azarmidokht Elahi’s “Mask”. “Mask” is a beautifully composed study without a visible face; “Mental Load (the silent scream)” is a face in its full glory, expressing the frustration of women worldwide. Gather your thoughts, help yourself to a cup of tea, take a few minutes to browse the shelves. When you are ready to move on, lift your head or sit on the couch and examine the work on the walls. Who is that woman waving at us in Amani Haydar’s “Solitude in the Café”? Is she waving hello, or asking us to stop? Stop and do what? This is a joyful painting and equally as intriguing as Sue Theron’s “Taronga”, an almost surreal depiction of a woman in a bikini, sunbathing amid Sydney’s rampant construction industry, with a Komodo Dragon by her side. Definitely time to chill out on the couch while you think about the messages contained in these paintings. You’ll have to step up close to appreciate the detail of Shelly Watters “Anthropometry: 30 weeks pregnant”, an exquisitely simple print created by a young woman using her body as a press. Alongside this sits Sarah Yee’s drawing, “It Takes a Village”, which depicts a pyramid of hands in a statement about motherhood and the future place of girls in the world. Next is one of the women photographers included in this exhibition, Miela Malyon, who found profound beauty in the Kurnell Dunes and the glorious power of a woman’s naked body, as captured in her piece “Dune”. This group is rounded out by Zoe Freney’s “Carrying”, an image created in pastel that makes us smile and reminds us of the experiences of mothering. On the opposite wall, you’ll see drawings, prints, photographs, and a glorious circle of gilded bark in “A place west of here” by Sarah Taylor. Take your time to absorb this piece. It is simple and complex; each individual bark piece stands alone, while the whole asks us to consider how womankind has become disconnected from the natural world. Alongside this is Annmarie Murland’s “Drawing into Painting Muscular History Weaving #1” in black and white. This is a commanding piece that reflects drama and unrest. Nina Dawson’s “The Water Goddess” and “Some of My Mother’s Favourite Things 2” by Linda Cairnes draw on elements of the natural world. Nina Dawson’s piece interrogates the concept of womankind being protected and nurtured by the power of water — water that is alive, according to Girramay tradition. Meanwhile, the magpie and other elements in “Some of My Mother’s Favourite Things 2” illustrate the memory of a family ahead of its time, but still bound by the stifling tradition of life in the 1950s. Zorica Purlija, also included here, uses photography to express many possibilities in “Love Shines Through”. Finally, on this wall, we have Anne-Marie Yee’s “Of Tiaras and Tutus”. This artist uses symbolism to question accepted beliefs. If tiaras represent wealth and power, why don’t all women have one? Herland is not only spoken word and two dimensional art — this exhibition includes sculpture and moving images. Hopefully, you have allowed time to absorb all of this. The sculptures are gathered together, alongside the fiction section of the library. 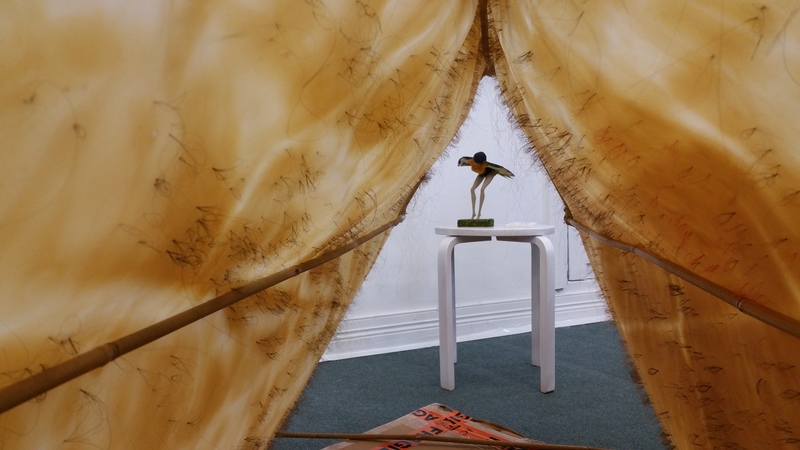 Nina Grodhal’s “Second Skin” is made from human hair, while Emily Valentine’s “Kidikeet” is composed of feathers. By now, if you have made it this far, I expect you have realised that this is not your run-of-the-mill exhibition. For some, “Second Skin” is an uncomfortable piece, as it queries the paradox of our admiration for hair on the female head, even as we are repulsed by it on the bathroom floor. “Kidikeet”, like “Black Barbie” uses a 20th Century icon to make a statement. Finally, we have a ceramic rendition of a beautiful couple dancing in Susan Curran’s “Dancing girls”: a celebration of women dancing for their own pleasure rather than for the pleasure of the onlookers. Two garments hang from the library’s central beam — and what could be more appropriate for an exhibition of work by women artists than these two dresses in the Herland exhibition. Sepideh Farzam’s “Unzipped Memories” and Nina Dawson’s “The Pocket Dress” both reference women’s memories and experiences. Follow that beam to the right or left and turn your attention to other work on the structure that holds up The Women’s Library. “Hearth Vision — Sleeping on Broken Glass” is Barbara Schrober’s response to the #metoo movement. Like Anne-Marie Yee, Schrober makes use of symbolism. In this case, the Tondi form (a round canvas) and appropriate colours emphasise the fragility of the female form within the earth. Directly opposite is another artist who brings an outsider’s perspective to this Australian exhibition. Goya Torres incorporates Mexican culture into her work entitled “Female Totem”, representing the strength of wild women. Move slightly towards the entrance and you will see the perspective of a woman who has been part of a modern day Utopia nestled between Social Services and Environment. Hillary Monckton’s “Utopia”, a painting in acrylic and ink, is reminiscent of the time she spent living on Bracken, a women’s collective that was her personal utopia. Now it’s time to look for the small screens that might have been overlooked. If you are a woman, and even if you are not, you will be mesmerised by “Mother” produced by Stacha Clemens. This slow moving animation draws upon the stylistic clarity of early Soviet propaganda posters to extol the strength and superiority of women in the physical world. Freya Pitt’s video “Rehearsing Difference”, on the other hand, builds on images of self to create an intriguing film exploring the many versions of oneself. Take your time to watch this one, and, if you have time, watch it twice. Take a break on the couch before you leave. Hopefully you will take account of the resources available in The Women’s Library and make plans to come back soon. Before you go, make your way into the Journal Room, and spend time with Freÿa Black’s “WTF did you just say to me”. This is a message for all women, so make sure you stay to the end to experience the sound of adulation and applause resounding in your ears. Enjoy this applause, it is meant for all of us. As you carry this excitement, infuse it with a little inspiration before you head into the world beyond. Make your way to Gina Ropiha’s “Te Mamaeroa (the long hurt)” and contemplate how this simple bone artefact, balanced above a Kauri tree, can communicate sophisticated information. This is surely a metaphor for the power of women. Double-back towards the wall with windows again, appreciating the urban landscape beyond, and settle on Amelia Dowling’s “It’s not my job to carry your shame” perched on the window sill. Stitched (in red) onto a vintage postcard, this is a big statement; one that will resonate with all women. Take heed of Amelia’s statement and then, finally, pause and reflect on Kirsty Macafee’s “a new day” finely balanced between books on the biography shelf. This is another interpretation of women’s work, and one to inspire us all. Before you depart, pick up a price list. You will see that much of the artwork in this exhibition is reasonably priced and some is still available. If you don’t want to buy a piece just yet, spend $25.00 on an exhibition catalogue so you can remember these artists. Or if you really only came in looking for a book that you want to borrow, join The Women’s Library and help us thrive. Herland: in search of a female utopia was conceived and curated by Freÿa Black for The Women’s Library in Sydney. Exhibition dates: 8 March 2019 – 4 April 2019. Closed Mondays. Image above shows work by Emily Valentine and Nina Grodahl that is included in the Herland exhibition.